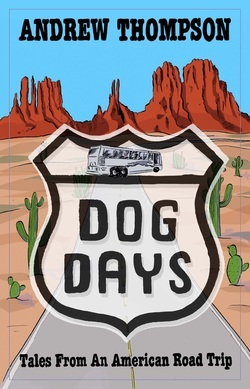 Dog Days is a lively account of a three month road trip that Andrew and his girlfriend Lucy took around the United States. They drove 15,000 miles around 45 states, by car and Greyhound bus, known as the ‘Dog’ by the fearsome locals who ride it. Describing their travels around the country, Dog Days follows them through landmarks like Monument Valley and Yellowstone, to a New York Yankees baseball game, a dude ranch in Montana and a rodeo in Wyoming. More than just a travel memoir, Dog Days provides vivid descriptions of the physical landscape, as well as detailing the characters they encountered along the way, and very candid observations of America and its people. Despite believing they knew a lot about the country, they quickly discovered just how different from the rest of the world it really is. "Ace book. Carefully observed and very funny...and dark at the same time. Dog Days drew me in 100 per cent." - Graham Johnson, author of Hack, Powder Wars, The Devil, The Cartel, and Druglord.